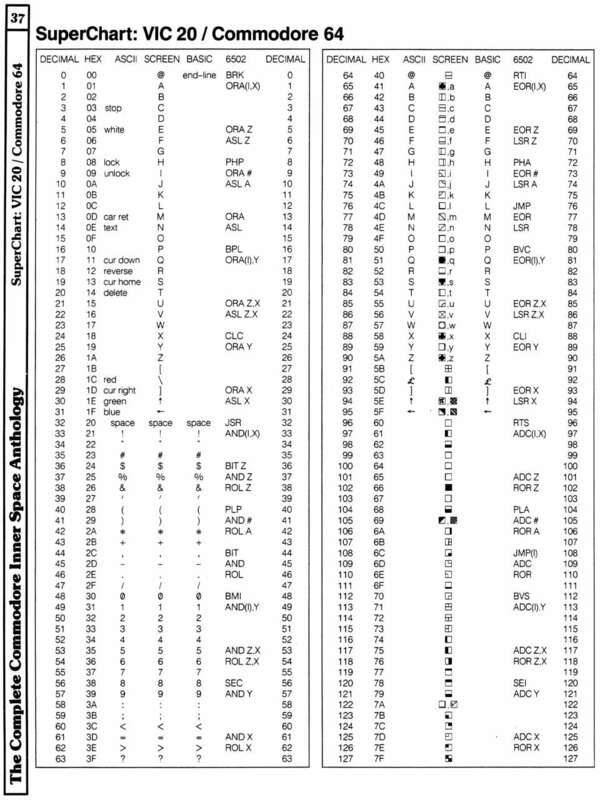 This table appears in The Complete Commodore Inner Space Anthology, pages 37 and 38. The data are rearranged here to best suit the format of a webpage, and a couple of pretty big errors in the Inner Space Anthology listing have been corrected. Corrections are noted below each block. It is called a SuperChart because it lists the PETSCII, ScreenCode (both character sets), BASIC character/token, and 6502 operation for every value in the 8-bit range. The numeric values are conveniently given in both decimal and hexadecimal. I'm digitizing it so I can have access to it without having the reference text open on the desk in front of me, and tagging it here as Programming Reference for others to find. Hopefully someone out there will find this chart as useful as I do. PETSCII, ScreenCodes and BASIC codes are roughly divided into 8 blocks of 32 characters each. 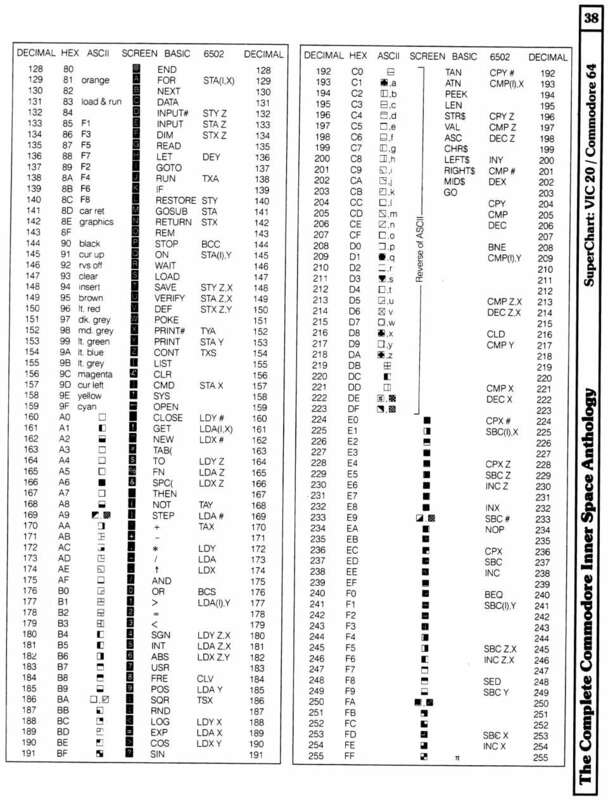 For this reason, the chart is presented below as eight 32-row tables. See the end discussion for an explanation of PETSCII's block structure. Corrections: Inner Space Anthology lists the block–1 alphabetic SCREEN CODES as only uppercase. They should be uppercase in the upper/graphics character set, and lowercase in the lower/upper character set, as shown above. Corrections: Inner Space Anthology lists the SCREEN CODE $1C as a backslash. It should be the british pound symbol (£) as shown above. Corrections: Inner Space Anthology lists the block–3 PETSCII alphabetic characters as uppercase. They should be lowercase as shown above. Corrections: Inner Space Anthology lists the block–3 SCREEN CODES lower/upper alphabetic characters as lowercase. They should be uppercase as shown above. Corrections: Inner Space Anthology lists the block–5 reversed alphabetic SCREEN CODES as only uppercase. They should be uppercase in the upper/graphics character set, and lowercase in the lower/upper character set, as shown above. Note: Inner Space Anthology lists two PETSCII values at $A9 and $BA in the block–6 range. See end discussion on the changes I've made above. Corrections: Inner Space Anthology lists the block–7 PETSCII alphabetic characters as lowercase. They should be uppercase as shown above. Note: Inner Space Anthology lists two PETSCII values from $C1 to $DA, $DE and $DF in the block–7 range. See end discussion on the changes I've made above. Corrections: Inner Space Anthology lists the block–8 reversed SCREEN CODES at $F7, $F8, and $F9 as their non–reversed counterparts at $77, $78 and $79. They should be reversed as shown above. Here are scans I found online of the SuperChart from pages 37 and 38 of the Complete Commodore Inner Space Anthology. The above chart is my own version / arrangement of this data. And the Inner Space Anthology version has errors as noted in my version. Understanding the difference between PETSCII values and Screen Codes can be confusing. The lists you will find if you search the internet for PETSCII Table do not all agree with one another, nor do they all agree with older listings found in books such as The Complete Commodore Inner Space Anthology. My SuperChart listing above is derived from Inner Space Anthology. I have made some corrections, as noted above, but I've also made some changes. I want to explain my reasons for the changes, even if others would not agree with me. The appearence of that character depends on the character set that is used. A character set is a 2 kilobyte bitmap. The screen code value is an index into that character set bitmap. The C64 and Vic-20 come with a character ROM, which is 4 kilobytes and contains 2 complete character sets. Additionally, custom character sets can be defined in RAM. Therefore, what actually gets displayed on screen is determined by the contents of the character set. In the two built–in character sets, the bottom half, 0 to 127, are all unique. But the upper half, 128 to 255, are the reverse of the bottom half. Conveniently, this means that toggling bit 7 of any screen code will exchange that character with the inverse version of itself. Custom character sets do not need to adhere to this standard, but the fact that the two built–in sets work this way was a very clever design decision. In order to make the cursor blink, the KERNAL need only toggle bit 7 on and off. A nice side effect is that it allows text to be written in reverse characters for titles that stand out, and doubles the available graphics characters for drawing PETSCII–based images. What the PETSCII values actually are is more contentious. Obviously, it cannot be the case that there is a one–to–one relationship between PETSCII values and Screen Codes. If there were, then every PETSCII value would have a visual representation, and there would be no room in the 8-bit space for control codes. The tables above are divided into 8 blocks of 32 characters, because PETSCII itself is divided into 8 blocks. And it is easiest to understand PETSCII by comparing those blocks with each other. The 8 blocks are further subdivided into the low 4 blocks, and the high 4 blocks, as indicated in the table of contents links at the top of the SuperChart. The high 4 blocks are like a shifted version of the low 4 blocks. PETSCII uses blocks 1, 2 and 3, and their shifted equivalents, 5, 6 and 7. PETSCII leaves block 4, and its shifted equivalent block 8, undefined. This provides a space of 192 values, however, in practice 22 of even those values are not defined. The alphabetic block 3 values are therefore the lowercase letters, which become their uppercase equivalents in the shifted block 7. And the symbolic / numeric block 2 becomes a set of 32 graphical symbols in the shifted block 6. The set of symbols don't have conceptual shifted alternatives, that's why the shifted block 6 is the block used for graphic symbols. Strings of PETSCII that are output through the KERNAL's Screen Editor are interpreted and mapped into Screen Codes, which are put in memory to be displayed. For example, there is no PETSCII code that represents "reversed lowercase a". However, the following PETSCII sequence: $0E, $12, $41, (that is "the control code for Lowercase/Uppercase character set", "the control code for Reverse On", and the PETSCII value for "a") will cause a reversed lowercase "a" to appear on the screen wherever the cursor currently is, and then the cursor will be advanced. That sequence of PETSCII is interpreted by the KERNAL, but it results in the Screen Code $81 being put into screen memory, and the Lowercase/Uppercase character set being selected. The above description of PETSCII is hard to uncover, because of how the alternative character set is laid out, and how PETSCII values are interpreted by the KERNAL's Screen Editor and converted to Screen Codes for display. 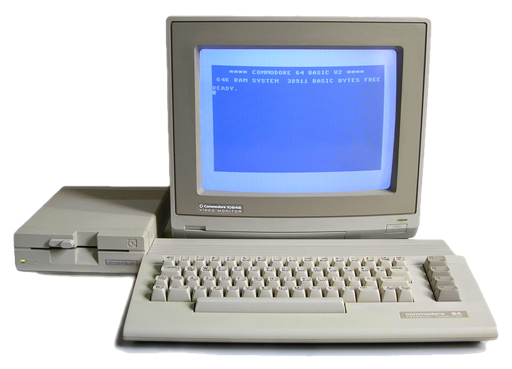 When a Commodore 64 is first turned on it is using the Uppercase/Graphics character set, rather than the Lowercase/Uppercase character set. It may simply be that Commodore thought having more graphics characters to work with in exchange for having only one case of alphabetic characters seemed like a good trade off. Now, if you're going to provide only one case of letters in a character set it will be uppercase not lowercase. Why is that? Well, many things are written in all–caps, but very few things are ever written in all lowercase. Hence the existence of the term all–caps, and the existence of all–caps fonts. Many words, such as the pronoun I and most proper names cannot be correctly rendered in small letters alone. In fact, in ancient writing, Latin, Greek, and Hebrew, there were no small letters, that is, no miniscules only majuscules. So it makes sense that the alternative character set is Uppercase/Graphics and not Lowercase/Graphics. However, it also makes sense that in the Uppercase/Graphics character set, it is the lowercase PETSCII values that are replaced by uppercase glyphs. Otherwise, when in Uppercase/Graphics mode you would have to constantly hold down shift in order to get letters instead of graphic symbols. But on the other hand, when you do switch character sets, it has to be that whatever you've typed without the shift key will appear as lowercase characters, otherwise, in the Lowercase/Uppercase character set, you'd be getting uppercase characters without the shift key, and you'd have to press the shift key to get a lowercase character. That just doesn't make any sense. And so, all this taken into consideration, one should not be confused about the PETSCII values on account of the existence, availability and even default–status of the Uppercase/Graphics character set. It is merely a character set, an alternative on–screen representation, that renders lowercase PETSCII values using a set of uppercase glyphs, and renders uppercase PETSCII values with an extended set of graphical glyphs. In a conversion from ASCII to PETSCII, though, ASCII's uppercase characters map to PETSCII's block 7, and ASCII's lowercase characters map to PETSCII's block 3. In my opinion, a "standard code of information interchange," which is what the SCII in PETSCII stands for, cannot have multiple meanings for the same value. Given that I feel there are good arguments that the lowercase alphabetic characters are in block 3, and the uppercase equivalents are in block 7, then the Lowercase/Uppercase character set should be used for deriving the canonical PETSCII values in block 6 and 7 where there are alternatives. Specifically, $A9 and $BA. These are mapped by the KERNAL to the Screen Codes $69 and $7A respectively. In this entire block (block 6), both character sets are identical, except for these two values. My listing indicates that the canonical PETSCII value is the character that appears in the Lowercase/Uppercase set, and that the other glyph is merely a result of swapping in an alternative character set. The only other contentious spot is $DE and $DF in block 7. These get mapped by the KERNAL to the Screen Codes $5E and $5F, where there is an alternative appearence in the Uppercase/Graphics set. This ambiguity is not there when you type the unshifted ↑ (PETSCII $5E, mapped to Screen Code $1E), because $1E is identical in both character sets. Here are the character set images, to help clarify how the Screen Codes work and differ between them. Lowercase/Uppercase Character Set, and Uppercase/Graphics Character Set. C64OS.com is more than just a blog about one developer's progress, it's a resource to support the C64 user and help them get the most out of modern hardware expansions for their beloved platform.